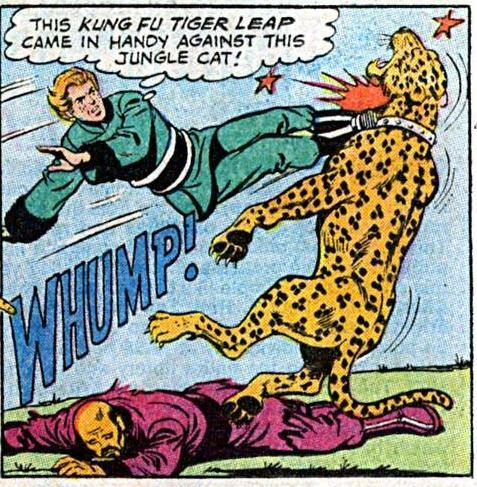 Whack a Lantern Week: Stop Hitting Yourself! Who's controlling Hal's power ring, Nelson Muntz? This is all Sally's fault! Friday Night Fights: Fair Fight Free For All - MARCO!!!...POLO!!! Welcome to Friday Night Fights: Fair Fight Free For All, the final prize fight in the Free For All bout. The ground rules? Anyone who won a previous round has to enter a new entry for this prize fight featuring a fight scene from a comic between two or more characters who are somewhat equally matched. The grand prize? An advance signed copy of the graphic novel Harbor Moon. 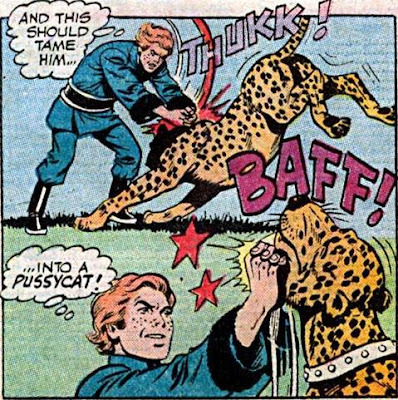 This fight comes to us from 1973's Jimmy Olsen#163, in a story titled "The World That Came Before",written by Leo Dorfman and illustrated by Kurt Schaffenberger. This time, the star transports Jimmy back to the 13th Century, where he's Marco Polo again. This time, he meets and befriends the Emperor Kublai Khan. Here, Jimmy/Marco and Khan are out hunting. 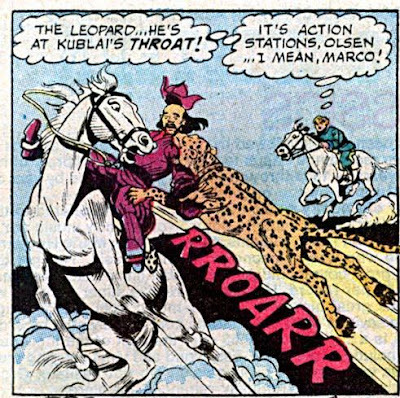 Unbeknownst to them, Khan's enemies have shot Khan's hunting leopard with a powerful drug which causes the leopard to fly into a rage and attack the first human he sees -- Kublai! 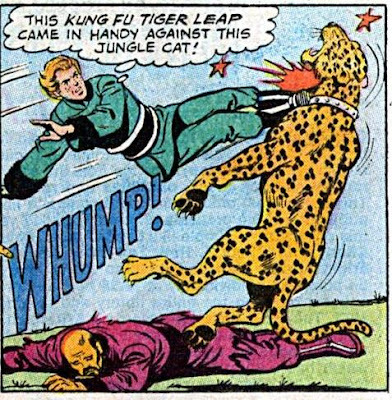 Jimmy springs into action, using his crazy-mad martial arts skills. For anyone else, being transported back in time, reliving a past life as Marco Polo, and subduing a leopard singlehandedly would be monumental events. For Pre-Crisis Jimmy Olsen, that's a Tuesday! For tonight's fight music, I can think of no song more fitting than "My Past Lives" by Too Much Joy. To see the other entries in this final round, click here. And don't forget to vote! .... Here's this classic by The Smiths. In honor of those who fought for us -- at all costs! Friday Night Fights: Free For All - Round 12: Green On Green, Part Tres! Our final round of Friday Night Fights: Free For All is also the final "Green On Green" round of this bout. 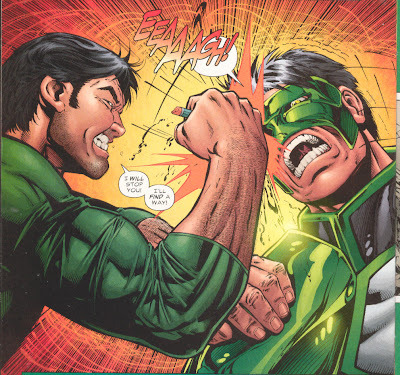 A "Green On Green" round is one where a Green Lantern fights a Green Lantern. I've featured Guy Gardner vs. Kilowog and John Stewart vs. Hal Jordan in prior "Green On Green" rounds, so tonight I'm shifting the spotlight onto Kyle Rayner. And who is Kyle's emerald-clad opponent in this round? Well, the Parallax part of himself, anyway. 2. Kyle is very imaginative. 3. Threatening one of Kyle's loved ones, particularly a woman? Big mistake! 4. 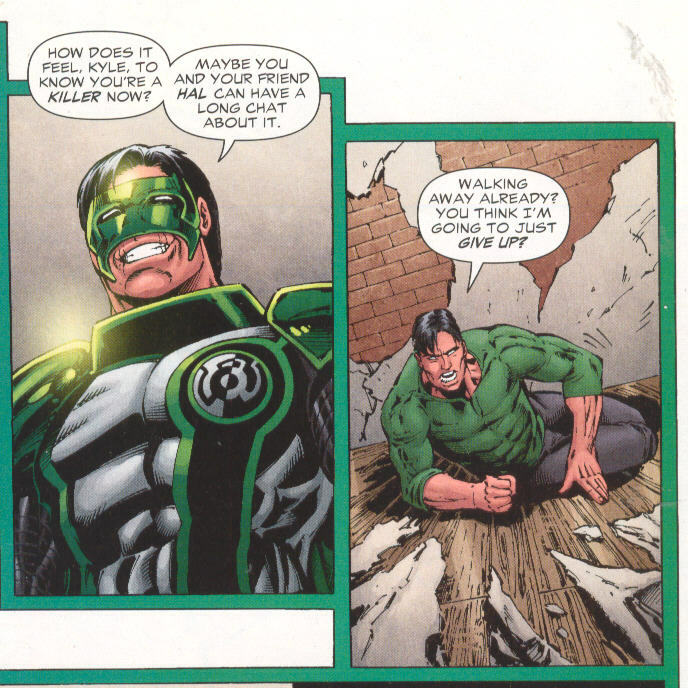 Kyle Rayner is awesome! Remember Kyle's famous "lead pipe moment"? This was his lead pencil moment! And he's had more great moments since then, even recently. Tonight's fight music is "In My Head" by Queens Of The Stone Age. For more awesome moments, click here. And, as always, don't forget to vote. "Me vote to punish President in election year that he's not on ballot." "Me mad about high taxes, so me vote to punish President that just gave me highest tax cut ever." "Me worried about growing deficit, so me vote to punish President who just reduced deficit by 103 billion." "Me mad that me getting ignored as voter, so me not vote. Me also mad that Republicans have too much power, so me stay home and, as a result, hand them more power." "Me dissatisfied that change not come fast enough over last two years, so me replace Speaker who was instrumental in getting changes over last two years with Speaker who worked to block all changes over last two years." "Me think President is Muslim whose beliefs were shaped by his Reverend Wright." "Me think not getting dropped by insurance company for getting sick is bad thing." "Me mad about current economic mess, so me vote back in party that caused current economic mess." "Me mad about lack of jobs, so me vote in party who blocked jobs bill." Oh, wait. 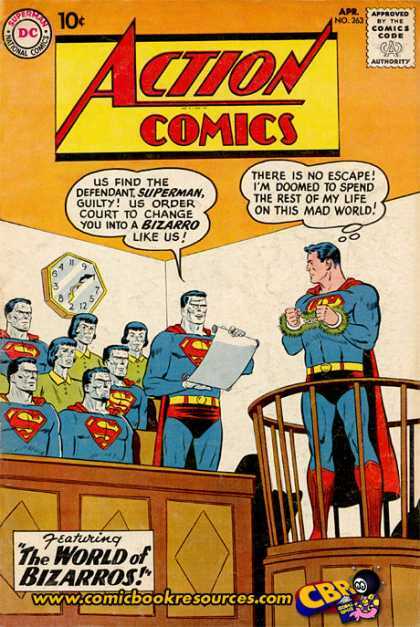 That wasn't the Bizarro World America . That was this America. Oh, I hear ya, buddy!